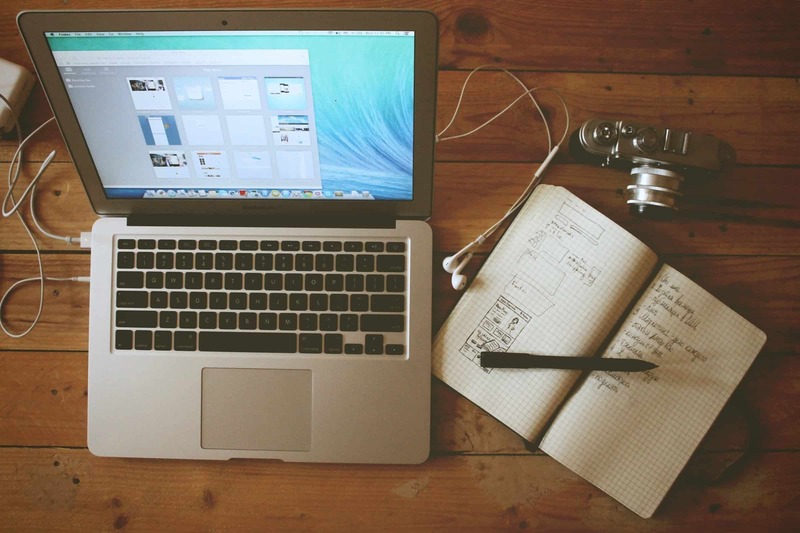 Are you happy with the performance of your website? Do you feel that it is providing high value for your business? Are you unable to make a judgment on whether the performance of your website is meeting the benchmark standards or needs some tweaking so that it does not end up merely taking up digital space instead of adding value to your efforts? The best way to find answers to these questions is to make use of website performance measurements and SEO metrics.If you are of the opinion that tracking the number of visitors to your website every month or keeping a count of the downloads and content views that your website attracts is a good way of measuring the performance of your website, you are only partially right. They are performance pointers, but they constitute only a small part of the bigger picture. If you have a fairly good idea about the overall performance of your website, that can help you take the right steps towards boosting the ranking of your website on top search engines and ensure greater business visibility online. There are many advanced websites and SEO audits available to help you measure the performance of your website on numerous counts. Many entrepreneurs are hesitant to invest their time, efforts, and resources on things that they are unable to comprehend, and website performance monitoring is one of those things. It is not a priority task for most businesses because it looks like a complex task. That’s why business owners are not too keen on committing their money on website audits as most of them are not clear on what to expect. 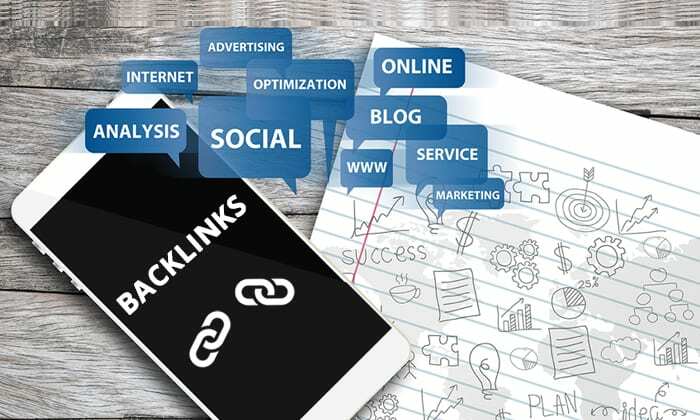 There are a number of SEO tools available for the purpose, starting from the very basic to the powerful, state-of-the-art, knowledge intensive tools. What many experts will try to sell to you as the best solution might not have the features that you are looking for to achieve quality auditing and monitoring of website performance. There could be many reasons why you need to do look website for SEO audit. 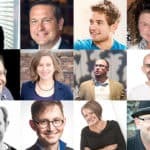 You will be able to get a clear idea of the issues that are creating problems for your website and also about those contributing to its positives. An audit will help you detect problems in the nascent stage before they blow out of control. Website and SEO issues can have a direct bearing on your ranking on top search engines. An audit can help boost website search engine rankings. You will be able to identify the reasons for reduction in traffic and leads and take corrective measures quickly. You can enhance the user experience for visitors which can result in more conversions and an increase in the frequency of visits. By running a check or audit on your website and SEO, you can identify areas that need improvement to improve the perception of your website visitors about your brand and company. An audit can help in detecting any problem/s that might have crept in while carrying out any major website changes or upgrades or redesigns. WooRank offers instant website review and can be availed as a free as well as a premium service. However, without a premium account, users can only generate specific reports. 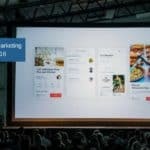 You can test the tool with a 7-day unlimited free trial. Marketing checklist will test the key items of your website. The SEO section will check if your website conforms to the various on-page and off-page SEO best practices. The mobile version of your site is checked and best mobile optimization practices are evaluated. The Usability section testes the user-friendliness of the site by assessing several best practices. Technologies checking will investigate miscellaneous factors like speed optimization, standards compliance, and others. The social feature will help measure the popularity of your website on social networks. 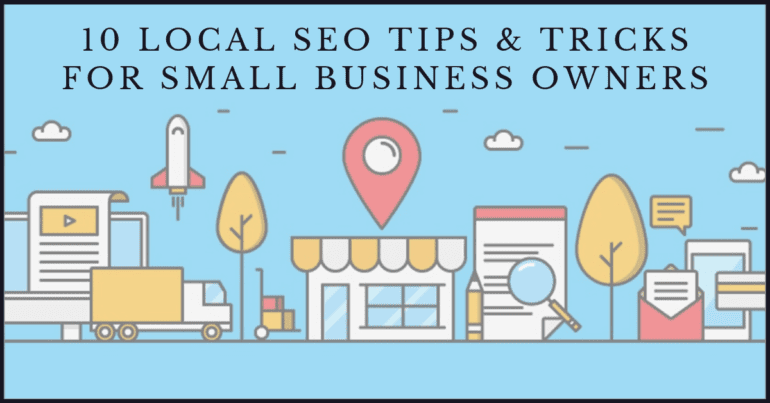 The local segment will reflect the listing of your website in local directories. The visitors section will measure the popularity of your website based on different factors. 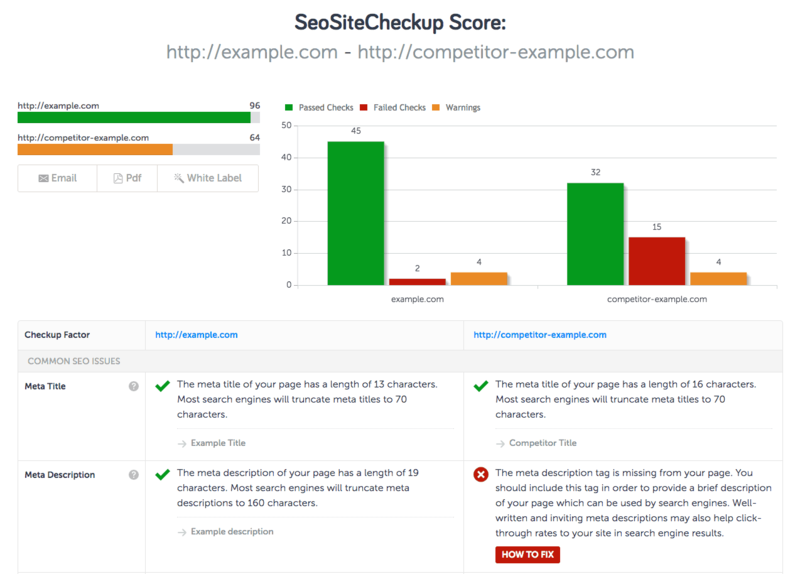 SEO Site Checkup is a free SEO analyzer that can run 45 individual checks across six categories on your website and that of your chosen competitor. 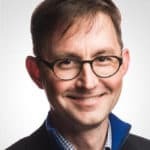 The tool will then create a summary based on the results of this detailed analysis and will provide a list of checks that failed to meet the expected performance standards. Common SEO checks section – includes a wide variety of SEO checks. Speed Optimization – analyzes different types of checks on load performance such as server speed, caching, page size, compression, and others. Server and Security checks – identifies key hosting and security characteristics of the site. Mobile Usability feature – checks the mobile friendliness of the site by providing a snapshot of what it looks like on mobile devices. Social Media section – helps measure the level of social engagement. This is done by providing the share counts for various popular social media sites. Site Auditor is a popular SEO tool from Raven Tools. 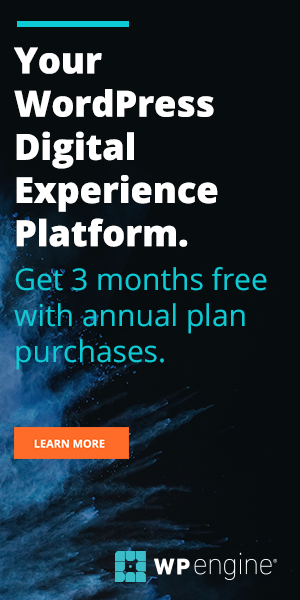 It comes with a 30-day free trial while the premium plan of $99/month is the lowest priced package. Visibility checks the site’s perceptibility for search engines. Meta section identifies your website’s most important metadata and corresponding duplicate titles, duplicate Meta descriptions, and others. 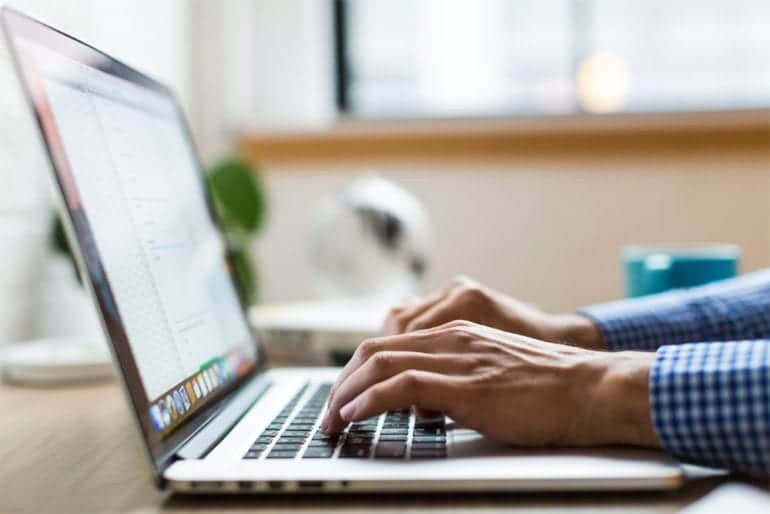 Content analyzes the characteristics of the textual content such as the title, link counts, word count, duplicate content on the site, and more. Links section provides information about the internal and external links of the website. This can include anchor text, details about broken links, information about links being followed or not followed, and others. The Images section will analyze the images and corresponding metadata of your website. The Desktop Page Speed feature measures the website’s desktop page speed results which is a numerical score and informs about the best speed-related practices. The Mobile Page Speed section provides data on mobile page speed results. The Crawl Comparison feature will compare different crawls of the site to evaluate how the site’s issues are changing over time. 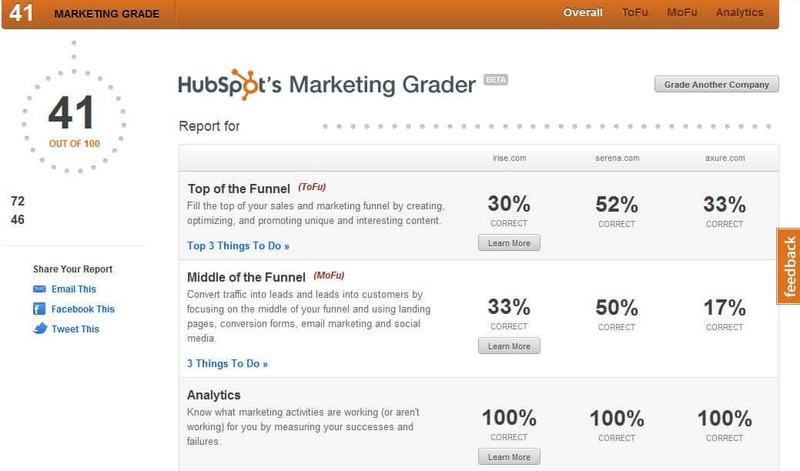 HubSpot Marketing Grader is a different type of analysis tool which focuses on the SEO activities of your site and also takes a closer look at your online marketing strategy. Blogging section will analyze your blogging activities and provide details of your social sharing buttons. Social Media section evaluates your social media activities. SEO section runs a check on key on-page and off-page SEO ranking factors. Lead Generation will analyze the efficiency of your landing pages on several aspects. The Mobile section will check if the page is mobile-friendly. 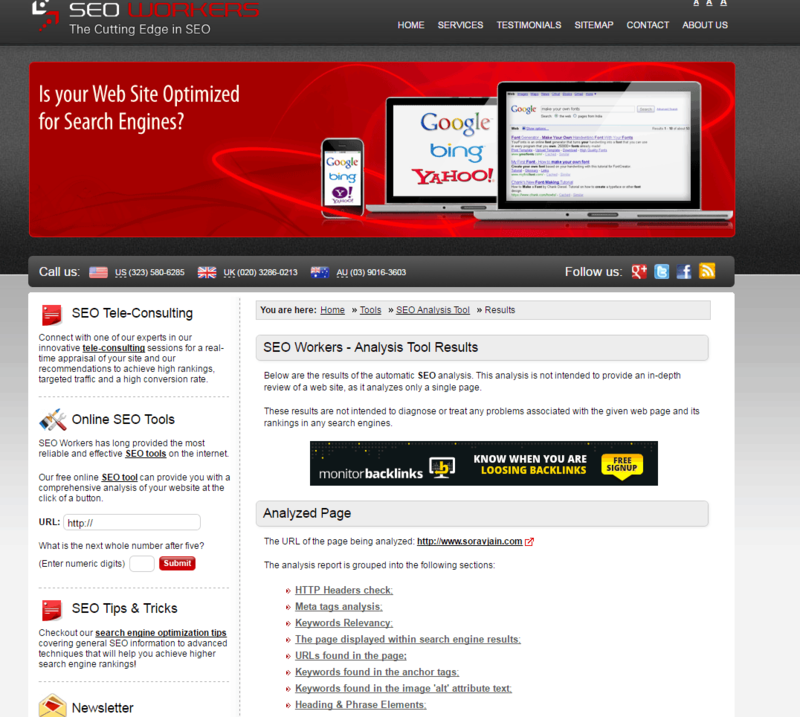 Site Analyzer is a popular free SEO analyzer. It presents a highly detailed analysis covering many critical and common data points organized into groups for greater convenience of users. You can also get an overview post the detailed analysis. The tool will also post scores on the basis of design, texts, multimedia, networking scores, etc. The Accessibility feature provides data about the website after checking for compression enabling, page caching download time, URL optimization, server configuration, mobile compatibility, and more. The Design section deals with the efficiency of design implementation across various HTML/CSS elements. The Texts feature shows reveals crucial information specific to text, including the density of keyword distribution, density of keywords, usage, headings, title, text/code ratio, and others. 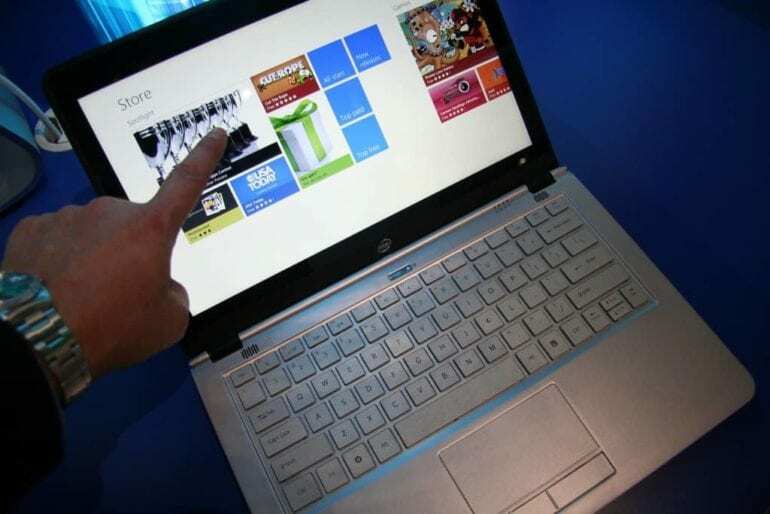 The Multimedia feature analyzes images in terms of numbers used, icons, flash frames, and others. Networking covers internal links such as link counts and percentages, indexation, and connections to popular social networks. SEO Workers is one of the most popular analysis tools that have proven to be very useful and effective in analyzing websites and SEO measures. The HTTP Headers Check section shows the HTTP headers that you are provided in response to a request for the given URL. Head Elements provides details of the most important elements such as heads, tags, and others along with some valuable expert advice. The Page Most Relevant Keywords and Key-phrases section provide details of the most popular keyword phrases based on the density of the keywords. The Page Displayed within Search Engine Results section shows what the page will look like in search engine results. All of the page’s internal and external out-links are displayed, as also the anchor text used in each of the page’s out-links. The tool provides a list of the phrases used in alt text for the page’s images. Also, the heading and stylistic tags of the pages are displayed. 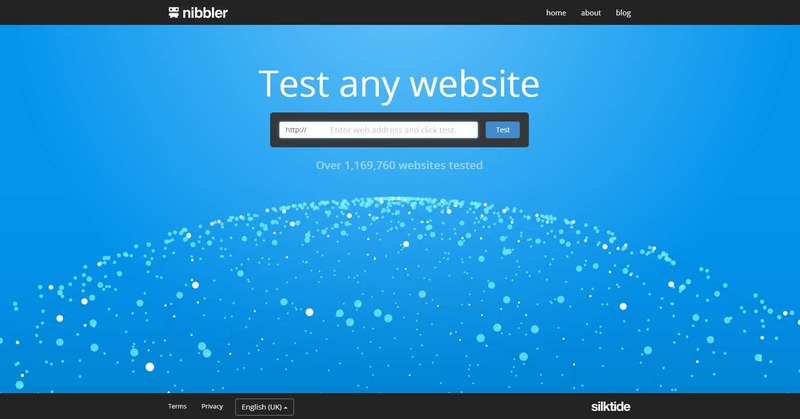 Nibbler is a free tool designed to perform 17 tests from a single website up to five linked pages. You can get detailed results for each of the five tested pages and some additional information in each of the 19 categories. Section-wise recommendations are also available. 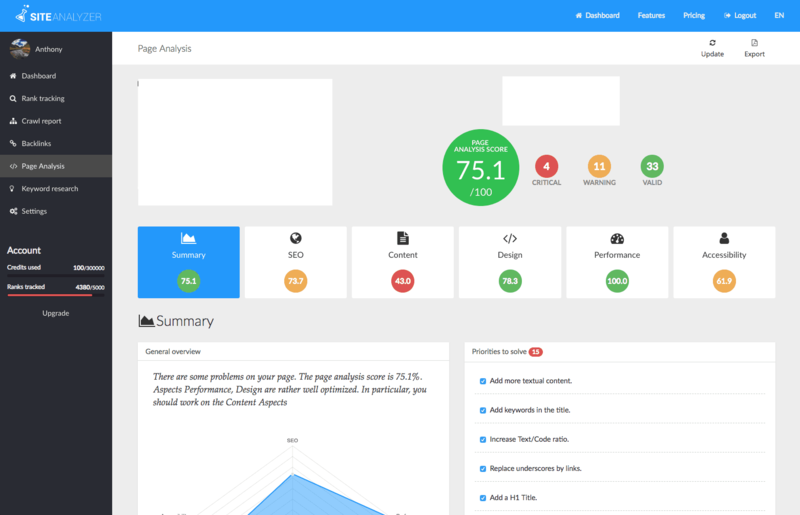 UpCity can help create a detailed SEO Report Card as a free basic report to run a quick analysis on your website. You can include a target keyword in the report to focus on in the analysis. The report covers key aspects of SEO such as rank analysis, link building, on-site analysis, website accessibility, and indexing. 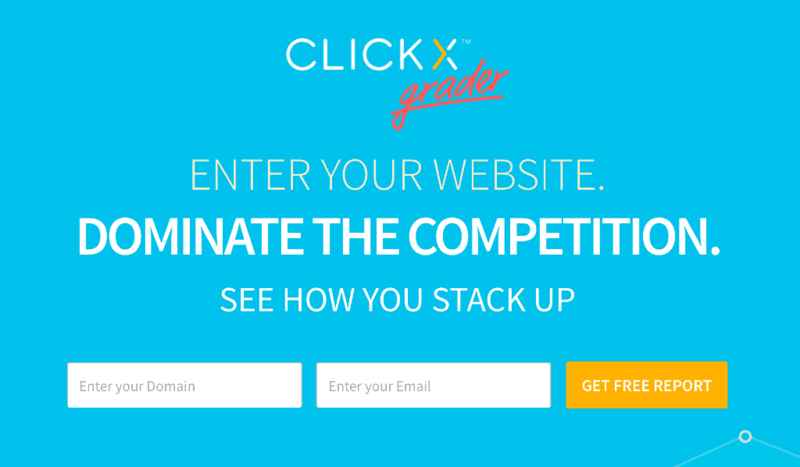 You can include the website of a competitor for comparison. You can run a rank analysis for any targeted keyword. You can get detailed Link Building analysis and an On-Page analysis. The features also include Website Accessibility and performance check and current Indexing Check. 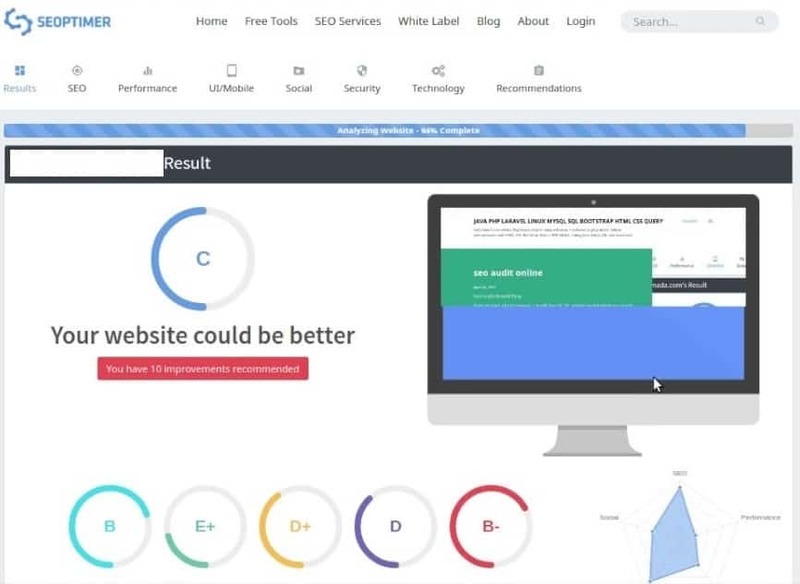 The ClickX SEO Grader report offers interesting and valuable data that can help companies understand the quality and performance of their website and also that of its critical SEO elements. The report takes a closer look at website performance, SEO, and backlinks. You can also get details about competitors, with a local audit thrown in. ClickX report also provides information on the best organic keywords, closest competitors and their relevance to their business, etc. 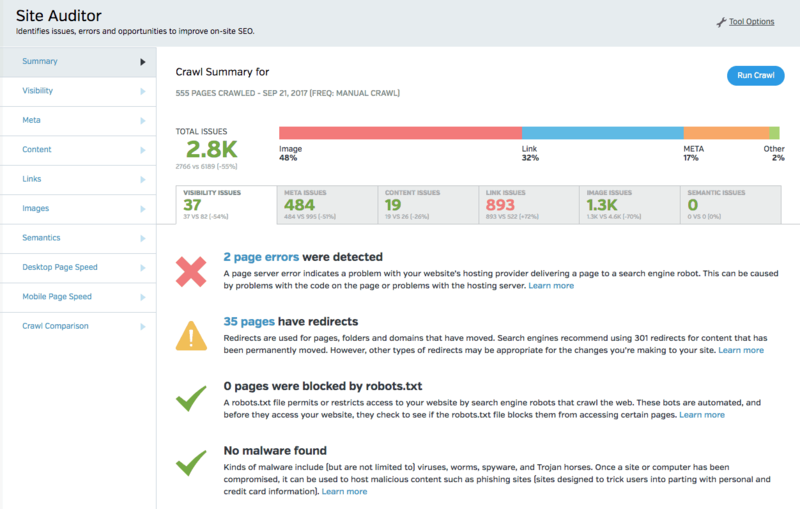 Seoptimer is a reputed free SEO analysis tool for investigating any URL’s on-page SEO ranking factors. You get a detailed summary of the most important action items. The HTML Header section covers the most important HTML elements. The Body Content section lists the top HTML body elements such as headings, images, and others. The Internal and External Links section provides details of the page’s internal and external out-links. The additional files section identifies the site’s robots. Social media signals show the shares of the URL on Facebook and Google+. HTTP Headers reveal the HTTP response for the URL. The Domain and Server section provides information about the page’s web server. If you have read carefully this far, you will most likely have a useful overview of how website and SEO audit tools and services are used. Choosing the tools and services that best meet the needs of your business is the next big step. 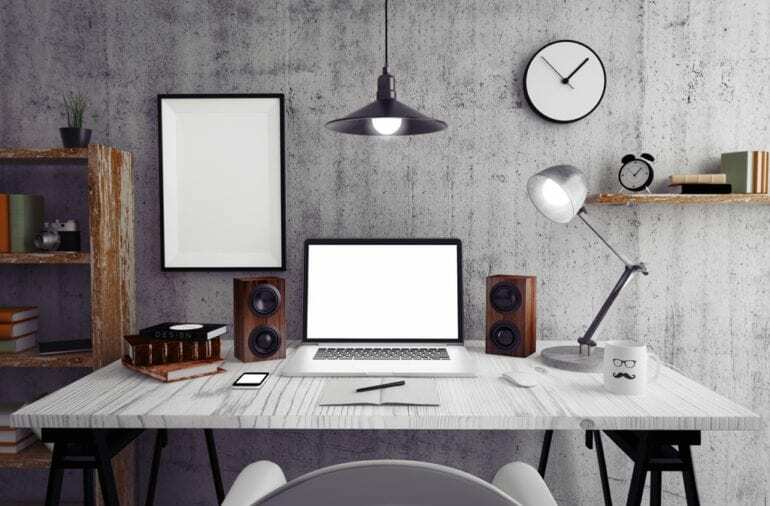 It will help you better if you are clearly aware of what your business needs in this arena so that you can allocate the necessary time and resources accordingly and get the best value for your money. Making the buying decision after analyzing all the options available is definitely better than following someone else’s recommendation or path. If you are new to SEO and website audits, it is recommended that you start by using some of the free tools. Also, it is important to understand that website and audit tools are in a state of constant evolution and churn. You are advised to check for the latest feature and upgrades for the tools that are of interest to your organization.